Mercedes A-Class (2004-2012) - Car Reliability Index | Reliability Index | How reliable is your car? The smallest car to wear a Mercedes badge, the first- and second-generation A-Classes never really captured buyers' imaginations, despite their innovative design and construction. 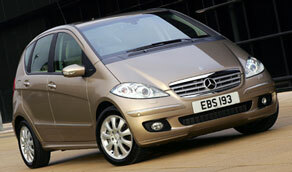 The A-Class wouldn't be a success for Mercedes until the much more conventional third-generation model arrived in 2012. A big improvement over the first iteration, the A-Class Mk2 featured a spacious cabin, excellent build quality and brilliant diesel engines, so the baby Merc lived up to the promise of the three-pointed star. After that it's more of a mixed bag, but with the car providing the cabin space of an E-Class in a car little longer than a Mini, while the A-Class isn't big, it is clever. 12/04 The second-generation A-Class is launched with a choice of 1.5, 1.7 or 2.0-litre petrol engines, along with a 2.0-litre turbodiesel in three different forms (82bhp A160 CDi, 109bhp A180 CDi and 140bhp A200 CDi). 10/05 A turbocharged 2.0-litre petrol engine is now available, in the A200 Turbo. 7/08 A facelifted A-Class is launched, with more safety equipment, better multimedia systems and cosmetic tweaks. It also features more efficient engines with reduced CO2 emissions. Low-mileage diesel cars can suffer from glow plugs that have bonded themselves to the cylinder head. The simulated leather of some cars isn't always that tough, so check for splits and other damage. Some owners find the suspension too firm for comfort, so try the car on poor surfaces before buying. Electrics can be temperamental, especially items such as the powered windows and central locking, so make sure that everything works. The hose that feeds the washer for the rear window can detach, flooding the tailgate in the process. Brake discs don't generally last very long - the fronts often last just 25,000 miles. Replacements are costly and new pads will be needed too. Some colours such as metallic black can mark easily, so look for chips and scratches as well as damage from bird droppings.